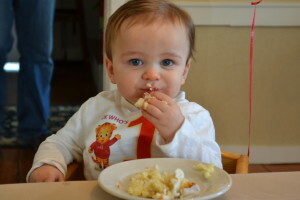 My little guy turns ONE! 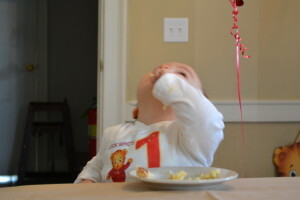 Michael turning one was so bittersweet, which I am sure it is for many Moms. You love watching him grow into this little person but turning one means that he isn’t a little baby anymore! That big milestone and he also is starting to walk which is also exciting. 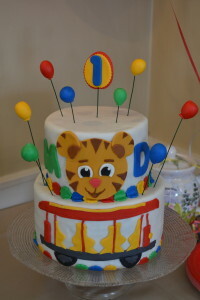 I chose to deal with Michael turning one by baking my brains out. I had another important job (the engagement cake order) and then wanted to have a special cake for Michael’s birthday as well. Luckily my family and friends were here to help as always. 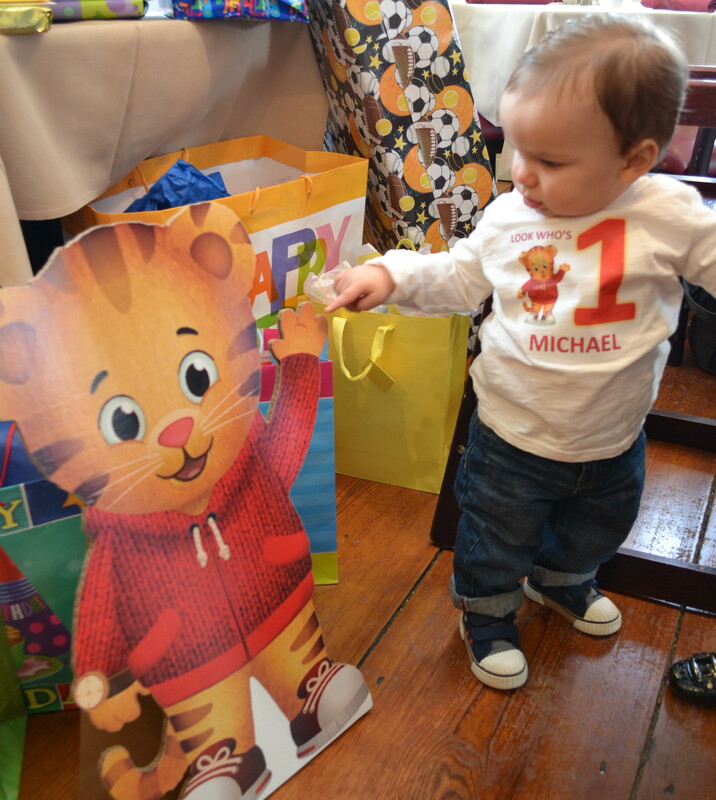 Michael LOVES Daniel Tiger and so we had the PBS show as his birthday theme. Here are a few pictures from the day. These were some of my favorite, especially when he ate his cake in about 3 minutes. He is really shoveling it in there! That makes a momma baker feel good. 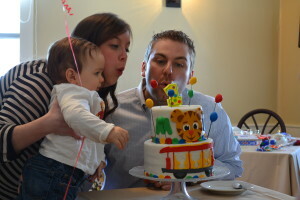 Here is a close up of the cake and him eating it! The cake was chocolate on the bottom and vanilla on the top. 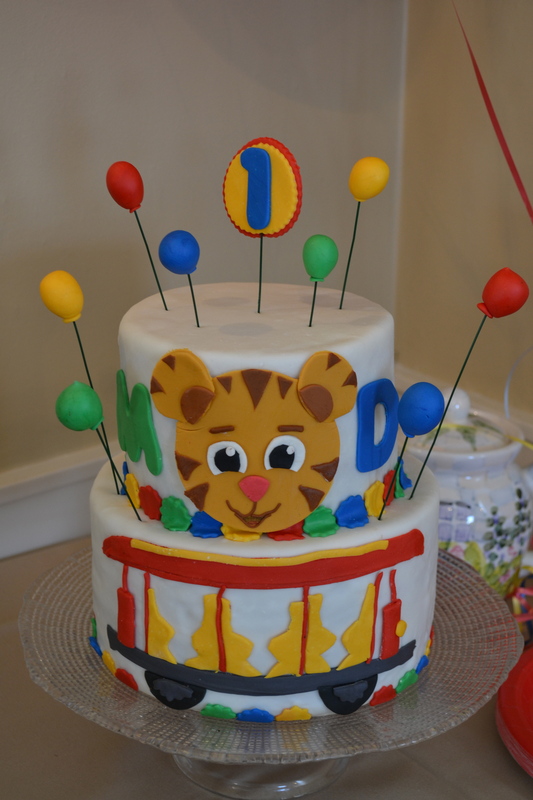 It had a gumpaste tiger face on the top that was hand created and then I also tried to replicate the trolley on the bottom. I created some balloons, which I learned to do from Krazy Kool Cakes. They have a wonderful video tutorial along with several other useful tutorials. I was happy with how it turned out and overall the party was a success. We were the first event at the Hummingbird House and everyone talked about how wonderful the food was. My sister-in-law did a great job and her staff was wonderful, helpful, and kind. I highly recommend the Hummingbird House for your events. Thank you for reading this post and checking out my cute baby (I know I am biased! hehe) and I hope that you are having a sweet day!